AKRON, Ohio – The Well Community Development Corp. is putting home-maintenance skills and tools into the hands of Middlebury residents to further its mission to revitalize the Akron neighborhood. A $20 fee is charged for the classes to cover expenses and give people an incentive to show up. The courses also can be taken as a series for a reduced fee. Lecture classes also will also be offered for $5. The class schedule will soon be posted on the Well’s website and on its events page. Users of the tool library must pay an annual $25 membership fee, and either be a Middlebury resident or have attended one home-maintenance class. The Well accepts donations for the tool library or donations of new tools. A wish list of items is posted on the Well website here. 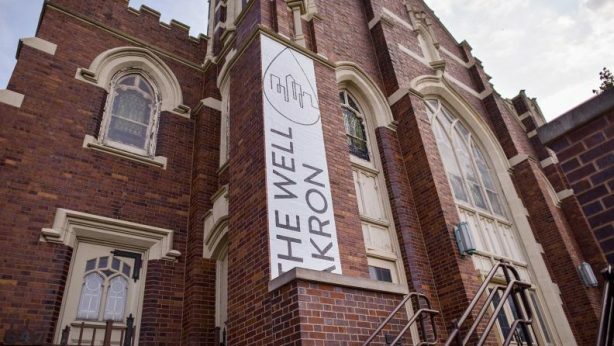 Housed in the former First Presbyterian Church on East Market Street, the Well has three priorities: reinvest in Middlebury’s housing, bring jobs to the neighborhood and create a neighborhood identity. The first settlement in Akron, Middlebury has the highest percentage of pre-1940 housing, the city of Akron reports. About 25 percent of homes are owner-occupied compared with 60 to 70 percent in healthy housing markets, the Well reports. Last January, the Well launched its 60 for 60 campaign, beginning the process of buying 60 blighted and move-in ready houses over 60 months. The houses will be renovated and turned into rentals the Well will manage. The intent is to raise revenue for the Well’s work, while keeping the houses out of the hands of slumlords, Well Executive Director Zac Kohl stated when the campaign launched. To help create a sense of community, the Well developed an outdoor event space that hosts the weekly Hapi Fresh Farmers Market behind the agency’s offices at 647 East Market St., offering produce, food trucks, beer and entertainment throughout the growing season. Compass Coffee, the Well’s for-profit arm, hosts a variety of community programs. It also houses Akron Food Works, the city’s first shared-use kitchen and incubator. The facility is designed to offer small businesses a commercial-grade kitchen in which to develop products, helping them transition more easily from a home kitchen to a licensed commercial kitchen. It also will offer workshops on starting and expanding a food business. To help guide revitalization efforts, Well officials plan to reveal a neighborhood development plan developed by MKSK, an urban planning firm based in Columbus. The plan identifies Middlebury’s strengths and weaknesses, and lays out recommendations to help restore the neighborhood. The event is set for 6 to 8 p.m. Tuesday, Dec. 4 in the main sanctuary at Family of Faith, 800 East Market St. in Akron.